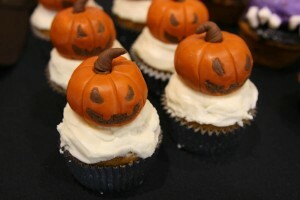 Prepare these scary starters to sustain and enhance the spirit of Halloween in the dining area. Simply cut the white bread slices with a ghost-shaped cookie cutter. The cutter can be customized for the required eerie shape. Spread a little chicken salad between the slices, add a thin layer of cream cheese to the top and decorate with sliced olives. Ghost-shaped cookie cutter: size 3 ½ to 4 ½ in. Cut-out the desired ghost from the bread slices using the cookie cutter. 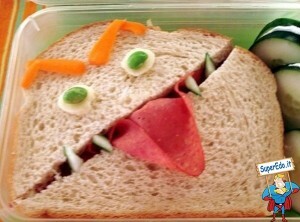 Spread about ¼ cup of chicken salad per sandwich to prepare 12 sandwiches. Uniformly spread about 1 tbsp. Of cream cheese on top slice of each sandwich. Make the eyes and mouth using olive slices and decorate it accordingly (may use parsley). The chicken salad can be prepared beforehand and refrigerated for 2 days. Rather than preparing the salad from scratch level, you can pick your favorite or the best available option from the nearby deli. 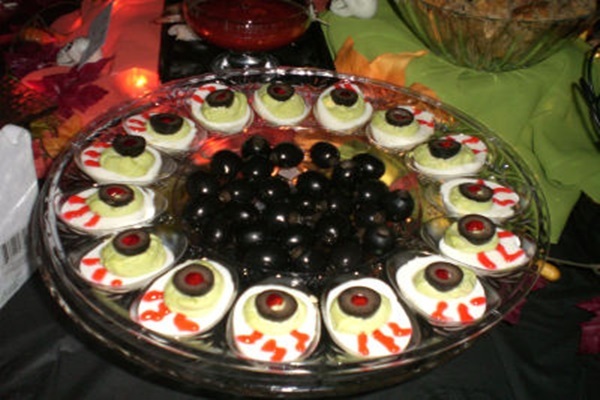 Beat up a batch of deviled eggs to forge them as ‘eyeballs’ and give them a spooky look using the black olive slices for the pupils and thin slices of pimiento for veins. Minced scallion or shallot: 1 tbsp. Hard cook the eggs: place eggs in a large pot and cover with 1 in. Cold water and bring it to full boil for 1 min. Remove the pot from stove and cover it. Let it sit covered for 15 to 17 minutes. Drain and run cold water over the eggs. Crack eggs and put them in cold water for 10 minutes or until cool. Drain the peeled eggs. Cut eggs in half, crosswise, a slight diagonally; carefully remove the yolks, leaving the whites intact. Put yolks in a bowl with mayonnaise, mustard, scallion, lemon juice, pepper sauce, Worcestershire and salt. Mash them together until blended and fairly smoothened. Using 2 spoons or a small ice cream scoop, mould yolk mixture into small balls and place it in hollows of whites to resemble eyeballs. Place the olive slice at top of each yolk ball. Slice pimiento into very thin 2 in. Long strips for veins. Decorate eyeballs with bloodshot veins. Spread some beans on a platter, which will support the eggs, so they may not roll. Place eyeballs upright in beans. Cover and refrigerate up to 6 hours before serving. 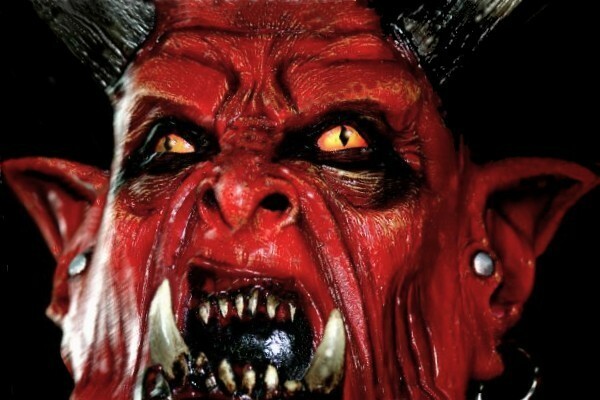 To give a more deadly look you may garnish them with tomato ketchup. To maintain the Halloween spirit the traditional cheese balls are moulded into little pumpkins packed with spicy flavor, featuring: cheddar, cream cheese, garlic salt and dry mustard blend together. Garlic salt: 1 ½ tsp. Put cheddar, cream cheese, garlic salt and mustard in a blender and process until smooth. Take the pan and coat it with nonstick spray. Fill the cavities with the cheese mixture; pack the mixture tightly into the pan by pressing it with the back of spoon to pack mixture tightly into pan. Use a plastic wrap to cover the pan and fridge it overnight. Fill a larger pan with hot water and briefly dip bottom of the chilled pan in it. Loosen the ‘pumpkins’ by tapping the pan on a flat surface, then unmould them. Before garnishing the tops of pumpkins with parsley sprigs attach the matching halves of pumpkins together. Serve with accompaniments. 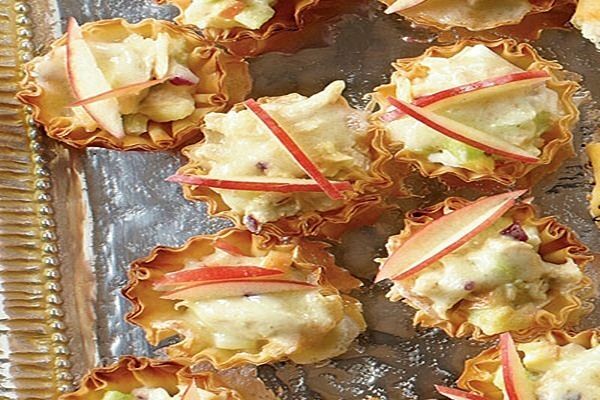 To make a tasty bite-sized appetizer mini-phyllo pastry shells are filled with creamy tuna-apple mixture and topped with cheese slices. Minced red onion: 2 tbsp. Fresh lemon juice: 1 tsp. Pour the first 8 ingredients listed in a medium bowl and stir together. Cover the bowl and freeze it for 1 hour. Place phyllo- shells on a 15 x 10 inch jelly roll pan; divide mixture among the shells (about 1 tbsp. Each). Layer the top with cheese pieces. Preheat broiler with oven rack 5 ½ inches from heat. Broil tartlets 1 to 2 minutes or until cheese is melted. Serve immediately. Garnish, if desired. Delicious chicken wings can be provided an eerie bat-wings appearance to aid the Halloween spirit. Oyster sauce: ¼ cup plus 2 tbsp. Food coloring black paste: 1 tsp. Pour soy sauce, oyster sauce, sugar, black bean sauce and food coloring paste in a bowl and whisk them together. Keep aside 1/3 cup of soy sauce mixture. Take a re-sealable plastic bag and place the wings in it, now pour the remaining soy sauce mixture over the wings, and seal the bag. Spread the mixture all over the wings by turning the bag. Chill the bag and let the wings marinate for at least 2 hours and up to overnight. Turn the wings for every 30 mins. For proper coating. Preheat oven to 375°. Use parchment paper or a nonstick baking mat to line 2 baking sheets. Set them aside. Drain the extra marinade and remove the wings. Shake them to discard drippings, and place them on the baking sheets. Arrange the wings so as to extend them. Bake them for 20-25 mins, until juices run clear. Brush them with the remaining soy sauce mixture for every 10 mins. Remove from oven and before serving let them cool slightly on a wire rack. 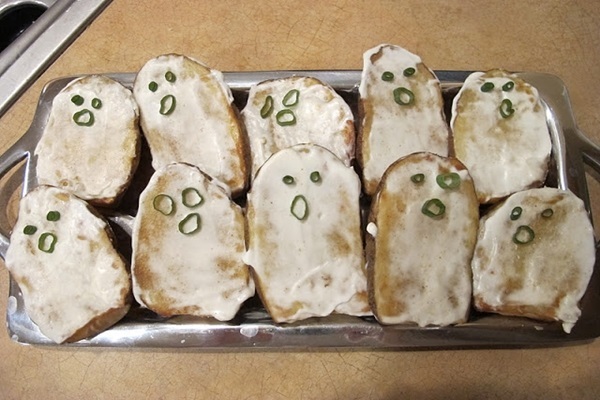 These potato skin ghosts may haunt your dining table or provide a spooky treat on Halloween night. For ½ inch slabs cut each potato lengthwise. Cut off the rounded tip of one end of each potato slab to give them a ghost shape. Lay the potato slabs on a greased baking sheet with the skin side of the potato down. Spread some olive oil on top of each slab by a brush and sprinkle some seasoned salt, onion powder and garlic salt on it. It would be easy to combine 1 tsp. Of each spice in a bowl and then sprinkle about 1/8 tsp. Of this mixture on each slab. Bake the slabs at 400º for 30 minutes. To check if cooked; pierce the slabs with a fork. Remove them from the oven, when the fork pierces easily, and let it cool for 10 mins. Spread some sour cream on each slab to prepare a tasty white ghost. Decorate it with slices of scallion for eyes and mouth. These crunchy little balls will prove to be a wonderful appetizer on the occasion of Halloween. Add cheese, 2tbsp of chives, the bacon and one of the eggs to the mashed potatoes. Mix them together in a large bowl with a spoon until blended. Shape the mixture into 1-inch balls. Spread the bread crumbs in a shallow bowl. Beat the remaining 5 eggs in another shallow vessel. Roll the balls in the crumbs, then dip them in the eggs and again coat them with bread crumbs. Heat oil to 375°f in a deep pan. Deep fry the potato balls, in sets, for 1 min. To 1 min. 30 sec. Or until they turn golden brown. Use paper towels to drain extra oil from balls when removed. Mix the remaining 2 tbsp. Chives with the sour cream and the dressing mix. Serve the warm potato balls with sauce. Add these horrifying appetizers to impress your guests on the Halloween night. Crushed red pepper flakes: ¼ tsp. Pour sesame oil, honey, lime juice and soy sauce in a small bowl, mix ginger root pepper flakes and garlic to them. Lengthwise cut the chicken tenders in halves and place them in a shallow glass vessel. Pour the marinade over chicken; turn the tenders for proper coating. Cover the vessel and chill for 2 hours. Stir them occasionally. While the chicken chills soak the bamboo skewers for 30 mins. 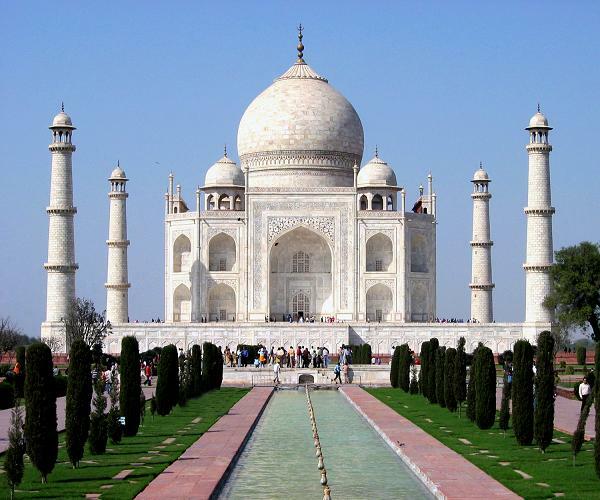 In water to prevent them from burning. Heat a gas or charcoal grill. Drain the marinade and let the chicken strips drip extra marinade. On each skewer thread 1 chicken strip. Twist the chicken on skewer to give a creepy snake like look. Place the skewers on grill over medium heat and cover it. Turn them regularly after every 6 min. Cook until the chicken is no longer pink at the center. Garnish the chicken on platter with sprinkled onions; serve it with peanut sauce.